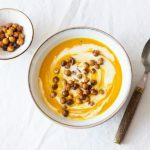 Before I share the recipe for this roasted kabocha squash and pear bisque, let me say that I resisted becoming a kabocha person until it actually happened. It seemed so trendy, so popular; surely there was nothing that made the kabocha squash so vastly superior to other winter squash varieties. Surely. But actually, kabocha squash is just…better. It’s the perfect marriage of sweet potato heft and heartiness with the not-too-sweet flavor of other winter squashes. The flesh is both dense and also magically, amazingly silky smooth. It is, in short, pretty magical, and once you’ve tasted it–no matter how annoying it is to chop it open and cut it into pieces and roast it–it’s hard to go back to butternut without a feeling of slight wistfulness. Kabocha squash is more work than other squashes for the principle reason that there’s no shortcut; it’s nearly impossible to find it pre-cut, so if you buy some, it’s probably a whole squash (or Japanese pumpkin). It’s also got a thick exterior, so the chopping itself isn’t easy (as opposed to, say, acorn or delicata squash, which are a breeze to cut). But, once you start to see it as a great culinary project, it becomes easier to embrace working with kabocha. In the past, I’d never have considered blending kabocha squash up into a soup; it felt like too precious an ingredient for that. But now that I’ve made kabocha soup, I have to say that it was totally worth it, because this particular soup is richer and more complex and somehow more sophisticated than my usual butternut or acorn concoctions. It’s a perfect Thanksgiving (or other holiday) appetizer, and if you have time to make it, the cashew cream makes the dish feel super special. Preheat your oven to 400F. Spread the kabocha squash, pear pieces, and onion onto two baking trays. Drizzle the pieces with the oil and use your hands to make sure everything is coated. Sprinkle generously with salt and pepper. Allow the squash and vegetables to roast until the squash is tender and caramelizing (30-35 minutes). Remove peels from the squash by gently scooping the flesh out with a spoon. Transfer the squash flesh and the roasted pears and onion to a blender. Add 3 cups of broth and ginger and blend till the mixture is smooth. Check for seasonings, and add extra salt and pepper as needed. Add the coconut or soy milk and blend again, till the soup is lighter in color and very creamy. Return the soup to the pot and add extra vegetable broth if it's too thick for your taste. 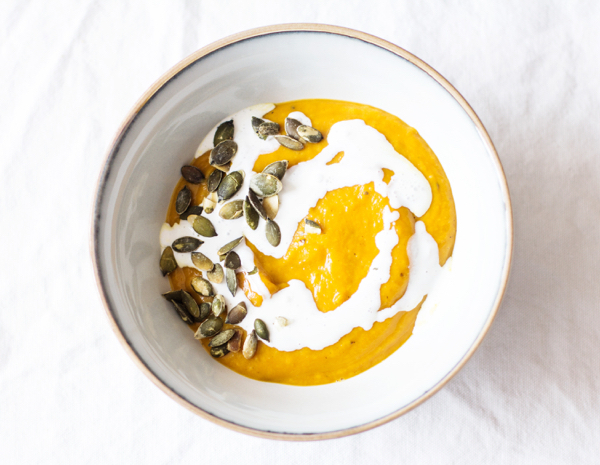 To serve, divide soup into bowls and drizzle each one with a tablespoon of cashew cream and a sprinkle of pumpkin seeds, if desired. 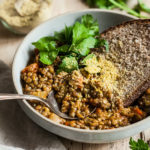 Leftover soup will keep for up to four days in an airtight container in the fridge, and it can be frozen for up to 1 month. 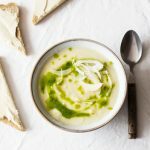 As I said, the soup is a great appetizer, but it’s also a great lunch, if you serve it with a sandwich or a nice, hearty salad. Hope you like it as much as I do. I’ll be back tomorrow! The roasted pear in this….swoon! Everything about this recipe is perfect. I agree, kabocha is totally worth the extra effort which is why I usually buy two or three at a time and get the prepping over, use what I need, and freeze the rest. Pinned! 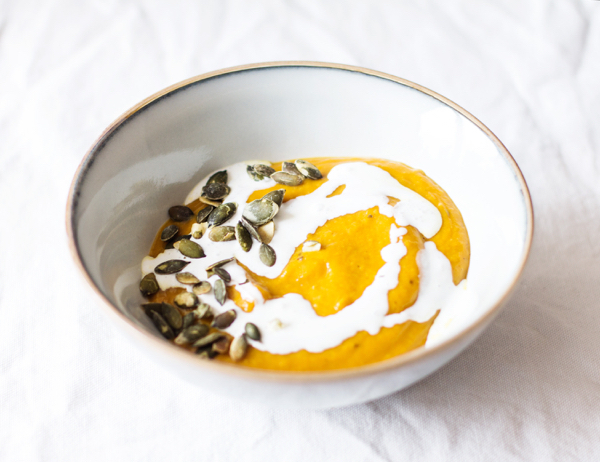 I have been all about squash and sweet potato soups lately but I’ve never used a kabocha squash in one before! I remember the kabocha squash hype but haven’t ever tried one… I think this needs to be remedied immediately! Love the idea of a cashew creme fraiche too! Yum! 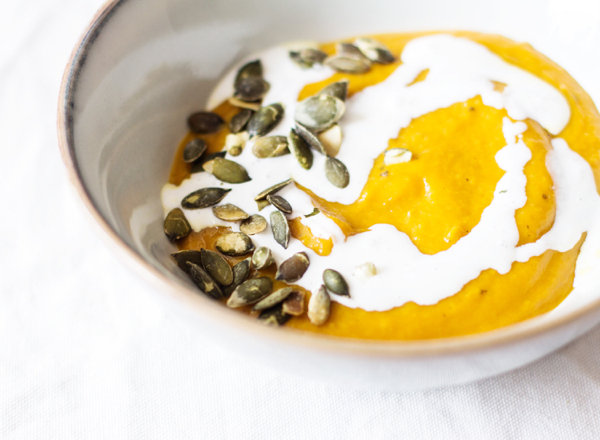 I made a very similar-looking soup last night using a recipe from the Vitamix cookbook (on the blog today), but it was pumpkin with soy yogurt. Also, I love kabocha because you can eat the skin….which makes chopping it seem like less of a hassle. Funny that you describe kambocha hard to cut since I use to love how easy itwas to cut. Looking back it was because I would peel butternut squash and acorn squash before roasting. I love the skin of kambocha and cooking it in an udon noodle hot pot. Omg, I need to eat this *now*! I tried kabocha for the first time the year and I completely understand why it’s your favorite squash. This soup looks stunning!!! That looks amazing. 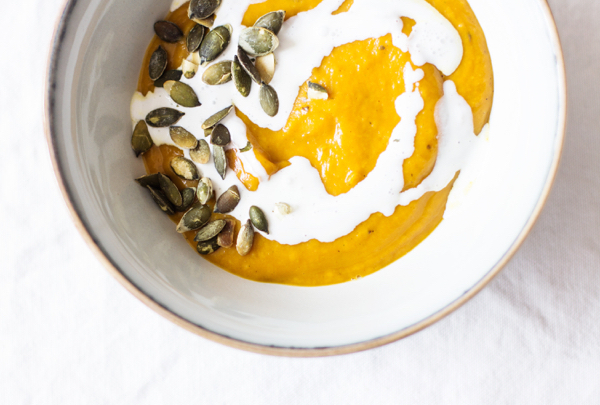 We’re getting Kabocha in the next week’s produce shares, so I’m definitely going to make this soup. We’ve also been on a soup spree at home! Perfect timing with the recipe! I would have never thought of making a soup out of it, but considering how much I love to with butternut, this would be great too. Hallelujah! Finally, a recipe with the only squash I CAN easily buy here in Japan. 🙂 This looks delicious and hopefully, it will grace our table next week on Thanksgiving. In the past I have used a hammer and blunt force on my back steps to break up extremely hard kabocha squash. This time I left it outside for a few days when the temps were below freezing. When I brought it in and let it thaw it was easy to cut and I think even sweeter! 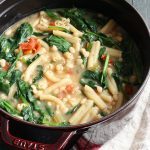 This gorgeous soup will be the starter for our Thanksgiving feast!